From bars and barber shops to bike shops, clothing stores, and restaurants, locally owned businesses in the Reno area work every day to earn your trust with quality goods and services. While they are at it, they employ local residents, pay local taxes, and in turn support other locally owned businesses. 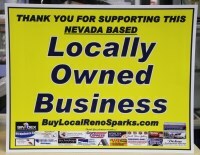 Supporting locally owned businesses is good for everyone living in the Reno area. Dollars circulate through the community rather than leaving town like they do when we spend at big box corporate stores. Buying local helps create a wonderful mix of small businesses throughout various districts in town, giving us more personal shopping experiences that can actually be enjoyable. Think about it - when was the last time you thought it was fun to be pushed and shoved by crowds and ignored by salespeople (who know nothing anyway) at the big mall or big box store? City of Reno - The city government is sponsoring "Buy Local, Reno!" to encourage residents to patronize locally owned businesses. If you are a local business person, you can join other locals by registering on the website. Your business name, location, and other information will appear on an interactive map that consumers can filter through in various ways to find what they are looking for. Buy Local Reno Sparks / Buy Nevada First - This organization is a combination of searchable listings of Nevada owned and Nevada based businesses, plus a physical store selling only things made in Nevada. The whole thing is the work of Reno entrepreneur Dave Asher. The Buy Nevada First Gift Shop & Visitor Center is located in the Reno Town Mall at 4001 S. Virginia Street. If you are looking for a wide variety of Nevada made goods and food products, this is your store. Over 90% of the products in the store are made in Reno. The phone number is (775) 384-3153. The searchable directory Reno / Sparks area businesses and local businesses in other parts of northern Nevada. It is free to register your business in the directory, but you might consider joining to support this buy local effort. About Small Business Saturday - Small Business Saturday was started in 2010 by American Express. It was in response to the need of their small business customers for more customers of their own. Small Business Saturday (held on the last Saturday in November) has become national in scope. The website offers both business owners and shoppers an opportunity to participate in promoting the shop local movement. According to the City of Reno, if everyone shifted 10 percent of their spending to local businesses, we would generate $350 million in our community. Every dollar spent locally generates three dollars in local economic activity. When you buy from a locally owned business, rather than a nationally owned businesses, significantly more of your money is used to make purchases from other local businesses and service providers. Locally owned business owners support non-profit organizations an average of 250% more than large national businesses. Locally owned, unique businesses help define our community's character and boost tourism. Visitors like to go to distinctive places rather than the same old stuff found everywhere. Locally owned businesses provide good jobs for local residents, which has a domino effect in that these employees tend to spend at other small businesses. You get better service at locally owned businesses - they know their products and services, and more importantly, they get to know you, the customer. Local business owners are invested in the community and more likely to contribute to the area's future well-being. A variety of local small businesses can better cater to their customers' needs and interests. Locally owned businesses use public services more efficiently and generally require little infrastructure investment than nationally owned stores. Think big box stores in sprawling shopping centers on the fringes of town needing new streets, water and electricity, and fire and police services. For a more in-depth discussion about the advantages of supporting our locally owned businesses, refer to "The Benefits of Shopping and Buying Locally" from the American Independent Business Alliance (AMIBA). Sources: City of Reno, American Independent Business Alliance, Sustainable Connections, American Express.